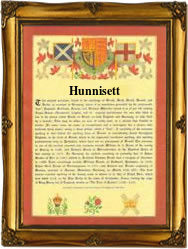 Recorded as Honisett, Honeysett, Honeystreet, Honeyseth, Hunnisett, and possibly others, this is an English surname. It would seem to originate from some place similar to the 'lost' medieval village of Honeycote (Huna's cottage) in the county of Leicestershire, or possibly even the same place, but this is not proven. The meaning of this surname would seem to be 'Huna's place' from the popular Olde English pre 7th century personal name 'Huna' meaning the bear cub, and 'geset', a dwelling place. 'Huna' appears in many place names including Honiton in Devon, and Honingham in Norfolk. This surname in the spelling of Honeysett is well recorded in the surviving church registers of the city of London, although strangely all other forms seem to be rare or extinct. Locational surnames are usually 'from' names. That is to say names given to people after they left their original homes to move somewhere else. In so doing they took or were given for easy identification, the name of the former village or even town. Spelling being at best erratic lead to the development of 'sounds like' spellings, some far removed from the original.